You know how important a good breakfast is for children. However, sometimes there simply is not enough time in the busy-ness of the morning to prepare a well-balanced meal. You don’t want to have them pour a bowl of sugar-sweetened cereal every morning for breakfast. Although, I’m sure my kids wouldn’t mind, I do like to throw in some healthy options instead. Even with picky eaters at your breakfast table, there is bound to be something on the following list of breakfast foods they will eat. 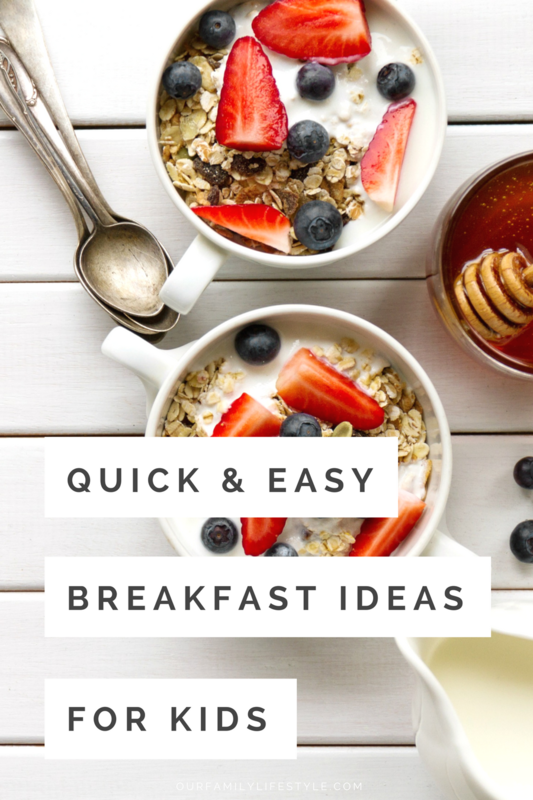 Besides, these quick and easy breakfast ideas for kids will help them have a great start to their day. One of the easiest breakfasts you can prepare for your children is to serve yogurt, granola and some type of fresh or frozen berry. Mix the three items together and serve with either milk or juice. This breakfast is delicious, nutritious and takes very little time on a busy morning. Oatmeal is a quick and easy breakfast idea that will also warm your children up on cold mornings. Substitute milk for ¼ of the water when preparing the oatmeal. Add 1 tablespoon of maple syrup and serve while it’s hot. Your children will love it. To make it even better, add fruit, raisins or chopped nuts. Scrambled eggs are relatively quick to prepare. Your child can choose the ingredients they want for their eggs – bell pepper, onion, diced meat, cheese, or something else entirely. Season to taste. Simply stir together the egg mixture and the selected mix-ins then cook it until done. This particular version is similar to a western omelet but you could add almost anything to scrambled eggs and they’d taste great because eggs are so versatile. Another option would be to scramble the eggs as above and add them to a warmed flour tortilla. This will make a wonderful breakfast burrito which can be eaten on the go, if necessary. If you have time to eat it at home, add salsa to the burrito and enjoy. Kids love pancakes but they can take more time that you might have during weekday mornings. Why not try French toast instead? Beat 8 eggs, ⅓ cup of milk, and ¼ teaspoon of ground nutmeg or cinnamon. Soak up to 8 bread slices. Heat a non-stick skillet and cook the slices, one at a time, turning the bread after 2 to 3 minutes on each side. Serve with syrup or sprinkled with powdered sugar – or both depending on your child’s taste. Cinnamon toast is another quick and easy breakfast idea for kids. Spread butter or margarine on as many slices of bread as you need. Sprinkle cinnamon sugar on the bread and place it in a 250° oven. Remove and serve when the butter or margarine is melted. Fruit salad would be something easy most children would love for breakfast. Cut up cantaloupe, strawberries, bananas and oranges into bite-sized pieces. Mix together 1 tablespoon honey with 1 tablespoon orange juice. Drizzle this over the fruit and let the children dig in. As parents, we want our kids to have something wholesome, as well as be quick and easy some days. Try these simple breakfast ideas for your children and see what they think!